Over the past few years that we've covered Misfit, the company has always been synonymous with simple activity trackers that look nice, have excellent water resistance, are versatile enough to be worn in different ways, work automatically and keep user involvement to a minimum, and are blessed with stellar battery life. Having reviewed both the Shine 2 and Flash, the 6 months battery life on a single CR2032 cell was more than impressive to me. But that's about to change with the newest entrant to the Misfit line. The Vapor is the company's first colored touchscreen smartwatch/activity tracker. It follows in the steps of the Phase, the analog watch with fitness smarts, but it changes the Misfit formula a lot more. The 44mm stainless steel body houses a 1.39" full circle AMOLED display at 326ppi, and is surrounded by a touch bezel that lets you switch watchfaces, apps, check notifications, and more without touching the screen and obscuring the content. Under the hood, there's Qualcomm's new wearable-oriented Snapdragon Wear 2100 processor that we've seen in several of the new Android Wear watches. There's also 4GB of memory to store music for Bluetooth listening without needing to have your phone with you. Oh and WiFi connectivity is also included, which probably means that it'll get notifications and synchronize without relying too much on the phone. The Vapor has an accelerometer, altimeter, gyroscope, optical heart rate sensor, GPS, and a microphone. It's not clear whether the latter is enabled now or will be enabled later, and what exactly it does, but I imagine it's there for some sort of voice control. Like Misfit's other products, Vapor is also swimproof and water resistant to 50meters, and it can track fitness, sleep, heart rate, and active times automatically, without any intervention on your side. Charging is done with a magnetic charging cradle (USB port on the other end), but the big letdown is that battery life is only 2 days. Compared to Misfit's other products, this is a big step down and I wish Misfit was able to crack the formula and give us somewhere around 10-20 days of battery life. The stainless steel body will be available in both Jet Black and Rose Gold and the Vapor will be available later this year for $199. LAS VEGAS, NV January 5th, 2016—Today Misfit announced Misfit Vapor, the brand’s first touchscreen smartwatch, featuring fitness, sleep, and heart rate tracking, as well as GPS and standalone music functionality. 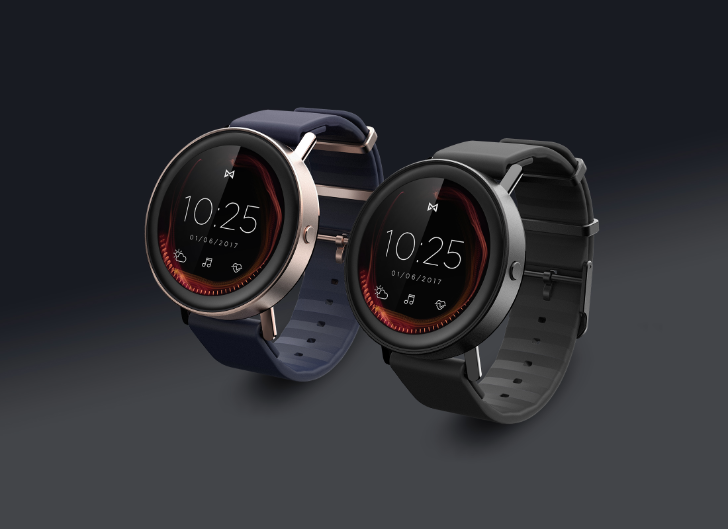 Vapor is Misfit’s most advanced wearable in terms of functionality, and rounds out the brand’s offering of design-forward wearables, complementing its suite of fitness trackers and recently launched hybrid smartwatch, Misfit Phase. Misfit Vapor features a stunning 1.39” full round AMOLED display, accentuating a vibrant color palette in 326 pixels per inch. Misfit Vapor leverages an accelerometer, altimeter, gyroscope, optical heart rate sensor, GPS, and microphone to deliver world-class fitness tracking and smartwatch applications straight to the wrist. Users can leave their phone behind while they track runs in real time or pair Bluetooth headphones directly to the device to listen to music wirelessly while working out. A touch bezel allows users to seamlessly browse Vapor’s menu of watchfaces and applications, and respond to notifications, without obscuring content on the display. Vapor is based on the Qualcomm® Snapdragon Wear™ 2100 processor and offers 4GB of memory as well as Bluetooth and Wi-Fi connectivity. It charges via a standard USB port and connects with a magnetic charging cradle, powering two days of battery life. Vapor is swimproof and water resistant to 50 meters. Vapor’s durable, 44mm satin-finished stainless steel upper casing is available in Jet Black or Rose Gold. The hand-polished stainless steel rear caseback cradles a dual-injected polycarbonate heart-rate sensor. The interchangeable straps feature stainless steel hardware in matching tones appropriate for any occasion. Priced at $199, Vapor will be available for purchase on misfit.com later this year. “Misfit Vapor opens the next chapter of even more customizable options for our users. Touchscreen smartwatches offer an almost infinitely versatile platform on which to build new experiences, products, and services. The future of wearables will grow out of both truly wearable hardware and advanced software that is tailored to create a compelling, personalized user experience. Vapor takes us one step closer to achieving that vision,” said Preston Moxcey, General Manager of Misfit. Misfit now offers a selection of wearables in all three of the wristworn wearable categories: activity trackers with Shine 2 and Ray, a hybrid smartwatch with Phase, and a touchscreen smartwatch with Vapor. Misfit products, including Misfit Phase Hybrid Smartwatch and the latest styles of Misfit Shine 2 and Ray featuring lime and lilac for spring, are now on display at International CES® 2017 at the Sands Expo #43825. Misfit will be exhibiting this year as part of Fossil Group’s new multi-brand exhibition space located in Tech West. Misfit makes design-forward wearables including Shine 2, Ray, and Phase. Misfit brand products are available at misfit.com and fashion and consumer electronic retailers around the world. To learn more about Misfit, a Fossil Group (NASDAQ: FOSL) brand, visit http://misfit.com/media.